The Childs Medieval Pants is a great addition to your childs medieval outfit. These striped pants are available in a wide variety of colors. The knightly pants are made of 100% cotton and are machine washable. 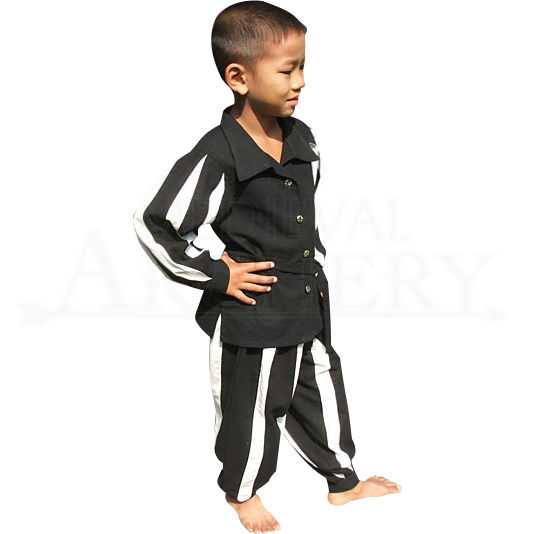 The Childs Medieval Pants comes in sizes small, medium, large and x-large. The waistband and cuffs of these pants are elastic, meaning they are quite adjustable to fit different body types and sizes. This pair of pants has full-length legs that are quite loose-fitting and baggy, although the extra fabric does not get in the way of a typical range of motion. The legs also feature a striped pattern that starts at the waist and extends downward toward the ankle in an inverted triangle shape. The Childs Medieval Pants are the perfect trousers for your young one to wear to medieval events and renaissance fairs.